1. I'm tired, I'm cranky, I need some me time. 2. Why do I have brown eyes and not blue? 3. How does this meme work, anyway? 4. Every morning, I put shampoo on my head. 5. I consider myself lucky because I love my job. 6. One day we’ll see everyone have the same right to be married. 7. And as for the weekend, tonight I'm looking forward to watching junk TV, tomorrow my plans include catching up on blogs and playing computer games and Sunday, I want to spend some time with Ricky! I haven't been blogging or blog-visiting much this week. I was in trial on Monday and Wednesday (I lost, if anyone is keeping score) and Ricky and I have been trying to finish up the DAMN INVITATIONS. The good news is, they went into the mail today, so I won't be blogging about them anymore! Now, to schedule the cake-tastings. Mmm. I also spent both Wednesday night and Thursday night out on the town, with the fiance's brother and some friends from work. That meant I got nothing done: no bills paid, no laundry done, no wedding stuff worked on. So this morning, before work, I had a little breakdown, which freaked the poor fiance' out. It was just a culmination of stress and not getting enough sleep (I never sleep before a trial, and our mattress was getting lumpy, so we had to turn it). I was also juggling competing requests for my presence at events this weekend. I had planned quite awhile ago to go away tomorrow with some girlfriends. It wasn't really the event that drew me; it was the chance to hang out with the girls. Then people started backing out. Then I got invited to do something ELSE with people I am closer to, and I felt a lot of pressure to do THAT instead, but I had already committed to the first thing...so I started to get stressed about it and lose my mind. And I cancelled everything. Just decided that if it was making me that crazy, it wasn't worth it, and I would just stay home and relax this weekend, especially after running around last weekend and the trial this week. So tomorrow, I don't intend to go anywhere or do anything. I might not even get out of my pajamas. Catching up on blogs, reading, playing some Wii...those are my plans. Oh wait. Except that I will schedule the cake-tasting. I will do that. Three lovely books came my way this week. Laurie R. King's The Game, another Mary Russell/Sherlock Holmes mystery, is one I Mooched. This episode in the series involves a British spy, allegedly the man Rudyard Kipling patterned Kim after, who has gone missing. Mary and Sherlock must travel to India to find him. Since I LOVE books set in India, particularly in Holmes' time period, this seemed like one I had to have. I also received two of three books that I won quite a while ago in a giveaway over at Heather's Library Ladder. The Day Watch and The Twilight Watch are books two and three in Sergei Lykyanenko's Russian vampire series. Book one is on its way! What books walked through YOUR door this week? Friday Fill-Ins Are Finally on Friday! 1. Give me too much free time at work and I'll never get anything done. 2. Whenever wherever, we're meant to be together. 3. I wish I had a million dollars. 4. A Friday night Big Mac was the last thing I ate that was utterly delicious. 5. To live in this world one must live with a lot of stupidity. 6. Other than this one, Bookgirl's Nightstand is the last blog I commented on. 7. And as for the weekend, tonight I'm looking forward to blog-hopping and watching the USA Friday night lineup, tomorrow my plans include printing the final invitations and Sunday, I want to schedule my cake-tasting! Okay, I did books, now for TV! 1. Name a TV show series in which you have seen every episode at least twice: Scrubs - Ricky's a HUGE fan, and it's on in syndication, so we're always falling asleep to it. I know some episodes by heart. 2. Name a show you can’t miss: Heroes (or I won't know what the HECK is going on) and The Amazing Race. 3. Name an actor that would make you more inclined to watch a show: David Duchovny, unless the show is on a premium channel (Californication?! ), and also Nathan Fillion...can't wait for his new show to premiere! 4. Name an actor who would make you less likely to watch a show: Andie McDowell or Nicholas Cage, if they were doing TV. I think both of them are terrible actors. 5. Name a show you can, and do, quote from: How I Met Your Mother..."LAWYERED!" 6. Name a show you like that no one else enjoys: The Big Bang Theory? Or else Raising the Bar, but all my PD friends watch that! 8. Name a show you would recommend everyone to watch: Raising the Bar. SO AWESOME. If a bit fake. 9. Name a TV series you own: Firefly; Northern Exposure; The Office...shall I go on? 10. Name an actor who launched his/her entertainment career in another medium, but has surprised you with his/her acting choices in television: Can't really think of anyone. 11. What is your favourite episode of your favourite series? "Eve" from The X-Files, my all-time favorite TV show. 12. Name a show you keep meaning to watch, but you just haven’t gotten around to yet: I've only seen a couple of episodes of Psych, and loved them, but haven't watched any back episodes and keep forgetting to tune in on Fridays. 13. Ever quit watching a show because it was so bad? Lost. I couldn't do it anymore. 14. Name a show that’s made you cry multiple times: Raising the Bar and/or Eli Stone. 15. What do you eat when you watch TV? Sometimes dinner, sometimes snacks...pretzels are good. 16. How often do you watch TV? Two to three hours on most nights. Some nights not at all. It depends on what's on. 17. What’s the last TV show you watched? Heroes, last night. 18. What’s your favourite/preferred genre of TV? Drama, with emphasis on Sci Fi and/or Westerns. For some reason, I cannot withstand the lure of a good Western. 19. What was the first TV show you were obsessed with? Obsessed with? The X-Files. My sister and I used to quote it to each other. 20. What TV show do you wish you never watched? Lost. See above. What a waste of my brain cells. 21. What’s the weirdest show you enjoyed? One of the Westerns...when I was a kid, I loved this show called Guns of Paradise (and later just Paradise) and also the one called Young Riders, I think, about the Pony Express. WTF? I don't like country, but I love me some Westerns. 22. What TV show scared you the most? Some episodes of The X-Files. 23. What is the funniest TV show you have ever watched? The Office and/or 30 Rock. Both crack me up. Ricky sent this to me and I thought I'd post it, just for something a little different. Well, this depends on if we're talking children's books, because I have some of those that have been around a while, or if we're talking adult books. Children's books, I'll go with either my Raggedy Ann and Andy books or A Peaceable Kingdom: The Shaker Abecedarius. I've had both since before I could even read. Adult books: I'll go with my L.M. Montgomery books; I've had them since about age 9 or 10. Okay, I didn't HATE it, but I really just didn't get into Pride and Prejudice. Anything else by Hemingway. HATE Hemingway. At the rate I'm reading, all of them. But, really, nothing in particular. 6. Last page: read it first or wait til the end? Oh my gosh, wait till the end! I'm so obsessive-compulsive that reading it first would kill me. I like the acknowledgements and I'll at least peek at them. If they are too boring, I won't slog through. Hmm, I'd like to be Mary Lennox in The Secret Garden. Any of the L.M. Montgomery books remind me of my aunt, who introduced them to me, and make me think of the last time I read them straight through, which was in April and May of 2002, right before I made the decision to go to law school. My friend Greer and I traded: my copy of Arundhati Roy's The God of Small Things for her copy of The Talented Mr. Ripley. Well, I loaned Sophie's World to my friend Susanna after a nasty break-up, when she needed something to keep her mind occupied. Probably The Stand, which was with me in Ohio, Georgia, Oregon, and Florida. It finally got Mooched away to another home, too. I haven't re-read much from high school. Maybe if I DO give Hemingway another go, I'll appreciate him much more now. Most of my re-reads have been things I loved, like Jane Eyre and To Kill a Mockingbird. Although it wasn't required reading, I couldn't make it through The Lord of the Rings back then, but loved it when I read it last year. Nothing too weird. Bookmarks, notes, etc. Used, if I can get it. It's cheaper and more eco-friendly. But, if not, I'll buy it new. That way, I support the authors and publishers and insure they stay around! I've not read much Stephen King, but I couldn't put The Stand down. Can't think of one. I like to read the book first, and the movie almost never stands up to the book. Any of my bloggy friends! Book Group Buzz and/or Booklist Online. For some reason, I've been thinking of these books a lot lately. But I couldn't remember the name of the main character or the author. All I could remember was that it was a girl who had to go live with rich relatives and there was a Native American friend, or something. So I had to call my mom to help out. Of course, she remembered, the girl's name was Mandie! Lois Gladys Leppard's Mandie series was a favorite of mine and Nat's when we were little. 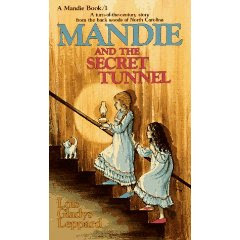 My mom bought us the first one, Mandie and the Secret Tunnel, at the grocery store one week, and every week after she would have to buy a new one to keep us quiet. Apparently, they were Christian fiction, which I don't remember as being central to the plot at all. I refreshed my memory of these books by going to Amazon (once I remembered the protagonist's name!) and looking them up. They were great adventure stories of the pioneer days. Mandie had an old Native American man named Uncle Ned watching over her, after her father died. I kind of want to see if my library has these, so I can read them over. They probably won't stand up to re-reading, so I might be in for a disappointment, but it would be nice to relive some of the wonder of my childhood reading experiences. Edited to Add: How sad! Lois Gladys Leppard passed away in October. However, it appears that she left behind at least 40 Mandie books. I know I've only read about ten of them. Maybe I really SHOULD check for them at the library. Also, they are published by Christian publishing company Bethany House, one of Bookfool's favorite publishers. 1. It seems like too much to handle, but it's usually not. 2. Ricky, shut the cabinets!!! when you're done, please? 3. If I thought you cared I'd tell you my life story! 4. A big load of books is what I think of most when I think of you. 5. To me, Valentine's Day means commercialism. 6. Ricky, the love of my life gives me strength. 7. And as for the weekend, Friday night I'm looking forward to Susanna's birthday Mexican and bowling party, tomorrow my plans include relaxing after a brutal week and Sunday, I want to finish up the wedding invitations! When I was a bitter, lonely, single girl (which really wasn't all that long ago) a friend and I used to wish each other a happy VD...we thought we were awfully funny. The truth is, I don't much care for Valentine's Day. I actually liked it better when I was single...at least I could sit on the couch and be miserable while eating a bucket of ice cream to console myself. Now that I'm in a relationship, I have to actually DO STUFF for Valentine's Day. I just see it as a pointless Hallmark holiday. I mean, Ricky and I tell each other "I love you" just about every five seconds, so we don't really need a special day to do it. But I did get him a card and candy, and we DID go out to Bonefish Grill the other night, as a real, honest-to-goodness date. Ricky's working all day today, so we had to celebrate early. And it was nice. Since we're almost married, we've lost a little of the magic that dates held when we first got together. Living with someone can really kill the romance. 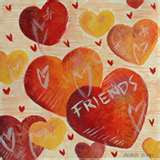 ANYWAY...Happy Valentine's Day to all my blog friends out there. I hope you get to spend some special time with the people you love today. Today's Mailbox Monday book was just received today, actually! It's a book I Mooched...Unfinished Cathedral by T.S. Stribling. It's the third in a trilogy. I'm still trying to find books one and two. Since it's an older series, and not incredibly popular, tracking down copies of the other books has been difficult. But, hopefully, something will pop up on BookMooch soon, or maybe I'll be able to Interlibrary Loan them. 1. Please don't tell my secrets. 2. Can you not be so damn perky in the morning? 3. The color red makes me want to dance! 4. I have a craving for sushi. 5. If my life had a pause button, I'd pause it on a nice, quiet weekend. 6. Eyes are the windows to the soul. 7. And as for the weekend, tonight I'm looking forward to going out for drinks with friends after work, tomorrow my plans include printing my wedding invitations and Sunday, I want to get some reading done! Ricky and I bought our wedding invitations tonight. We're printing them ourselves, and we totally lucked out. I had found some that we loved on Office Depot's website last night, but had several problems ordering them. First of all, the price changed after I added them to my cart. Then, the "Next Day Guarantee" somehow only guaranteed me delivery by Feb. 11. So I called the 800 number. After being redirected to "Joel" in India, I got the correct price, but found out that, apparently, only ONE SET of the damn invitations existed ANYWHERE IN THE WORLD. And they were special order, so they came directly from the manufacturer. So I got pissed, yelled at "Joel" at little bit, and hung up. Bridezilla much? Anyway, this evening, Ricky and I decided to go in to a local Office Depot to see what we could find as a substitute. And what we found was that everything I was told on the phone last night was a BUNCH OF BALONEY! Fate must have intervened, because I planned to go to the Office Depot on our side of town, but we ended up having dinner on the OTHER side of town, so we went to that Office Depot. They were going out of business and everything was discounted. We found the exact invitation sets that I loved online for 50% off. So, not only were they cheaper, but the idea that I had to wait till February 11th to get them, because there was only ONE SET available anywhere...that was complete crap. Moral of the story? I don't know. Don't order online before you check the store? If you want something done, do it yourself? Wedding invitations are a complete racket? Choose your own adventure, I guess. Mailbox Monday and an AWARD! Well, it's Mailbox Monday and I actually have something to report. Thursday, I received a copy of Laurie R. King's The Moor. This is another book in her Mary Russell series, detailing the marriage between Ms. Russell and Sherlock Holmes. I Mooched this book a couple of weeks ago. I have one or two others in the series, although I haven't read them yet. They look good enough, though, that I want to get all of them and check out the whole series. Unfortunately, that's all I brought home this week! There are so many more people I could have tagged, but I'll get them all the next time around. 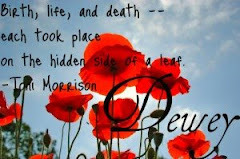 Check these folks out; their blogs are informative and, of course, full of great books!